A top-selling teacher resource line, The 100+ Series(TM) features over 100 reproducible activities in each book! 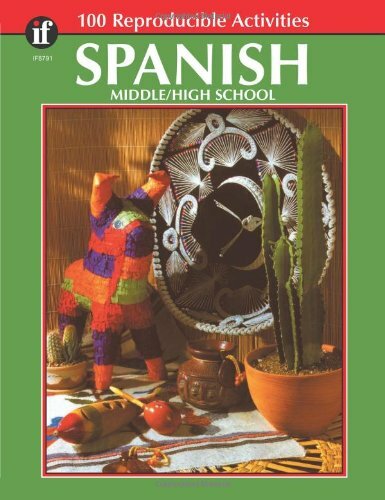 Help your student form a solid understanding of the Spanish language. Building on the basics, this book covers common phrases, functional vocabulary, conjugation of verbs, basic grammar, and sentence structure. Over 100 pages of reproducible activities get your students started on the path to speaking and writing Spanish. The activities provided offer fun and varied exercises to practice concepts and vocabulary. Students learn to tell time, formulate sentences,conjugate verbs, pose and answer questions, and make comparisons--all while learning about Spanish-speaking culture. If you have any questions about this product by Instructional Fair, contact us by completing and submitting the form below. If you are looking for a specif part number, please include it with your message.